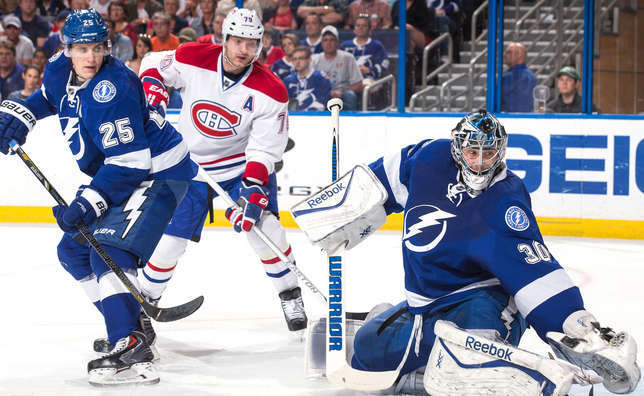 TAMPA BAY – Despite coming up short on Tuesday night in the Sunshine State, the Canadiens are playoff bound. Michel Therrien’s troops clinched a spot in the postseason when the Capitals and Devils both lost their respective tilts, ensuring the bleu-blanc-rouge will vie for the Stanley Cup for a second consecutive season. It wasn’t the way the Canadiens were hoping to secure their place in the NHL playoffs, particularly because a win over the Lightning at the Tampa Bay Times Forum would have put them over the top under their own terms, and provided an important confidence boost heading into a likely opening-round matchup against Jon Cooper’s contingent in a couple of weeks. Captain Brian Gionta shared similar sentiments in the aftermath of the Habs’ first loss since Mar. 20. With 10 postseason appearances and a Stanley Cup ring on his resume, the Rochester, NY native knows a thing or two about the ingredients necessary for playoff success in the long run. “It wasn’t the game we wanted to play and it’s not how we wanted to get in. It’s a tough matchup with a team we could possibly face. We wanted a little better effort, but the fact that we got some help from other teams, obviously it’s nice that we clinched,” confided Gionta, who admitted that deviating somewhat from their plan of attack and chasing the play as opposed to dictating it ultimately cost them the game. Carey Price will undoubtedly give them a good chance to do just that. On Tuesday night, the three-time All-Star put forward another stellar effort between the pipes, offering up a 30-save performance that featured one highlight-reel stop after another in front of Habs supporters aplenty. The Canadiens may have to go about that task without Douglas Murray for at least a few games after the veteran rearguard received a match penalty for elbowing defenseman Michael Kostka in the head late in the third period. That decision will be up to the league, which will likely review the hit in short order. Regardless of Murray’s fate, Therrien insists the key right now is to ensure the Canadiens are firing on all cylinders in their five remaining regular season games, two of which will come later this week with back-to-back contests against Ottawa and Detroit on Friday and Saturday night respectively.